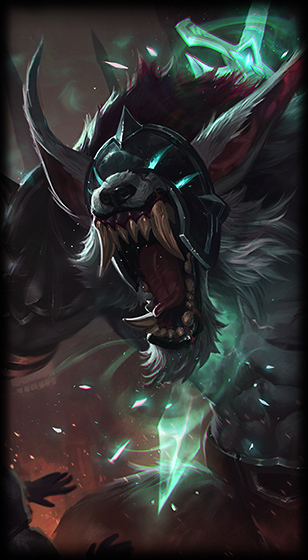 Grey Warwick was available for anyone who referred 3 friends to League of Legends. Your friend’s account needed at least a summoner level of 10, at that point you could redeem this skin, and other ingame rewards, such as IP, RP and champions. Due how hard it is to get 3 referred friends, Grey Warwick is a rare skin which is rarely seen in game. Lolskinshop allowed you to obtain this skin and Medieval Twitch at great prices and without any hassle. Unfortunetly the referal system has been shut down, and there is no way to obtain this skin any longer. The skins turns into limited skins, which may be brought back by Riot in the future, they have done it with all other skins. But for now, the only way of getting the skin is buying an account that has the skin unlocked! This skin is listed as one of the 15 rarest skins ever made to League of Legends, It is very popular and desired, but simply not possible to get. It is also one of the very few that has not ever been sold ingame for Riot points, so very few people have this skin, especially since the system to obtain it was shut down in 2015. Concept Warwick in a grey skin. Model Major model changes for Warwick.